As the holidays approach I can't help but channel the heroine from my book whenever I visit the store. So many Christmas lights, the cinnamony scent of pine cones in a bag, various holiday do-dads and knickknacks... Pure happiness in the holiday aisles. 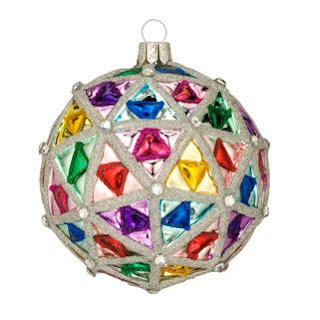 Personally, I do all my ornament shopping after the holidays. Especially since there's nothing more beautiful than a 75% off sign. That lovely Dreidel on White is available for $320.00. 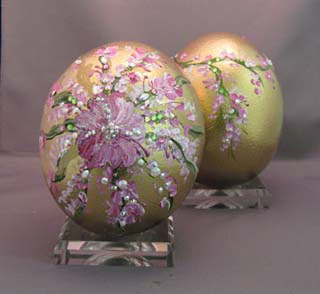 The Pink Floral on Ostrich Egg is $400 bones. Yep, you get that one ornament for four hundred dollars. For that kind of money I'm thinking the box needs to be covered in gold. If you have $400 to drop on an ornament, why not spend $100 grand? Were you able to count the diamonds on that puppy? 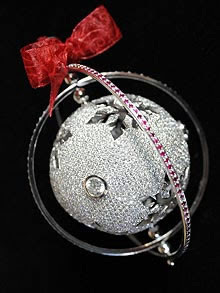 That shiny bauble is made of 18 carat white gold with 1,578 diamonds. It's surrounded by two rings made of 188 rubies! If you're pulling out your check book now I would stop unless you have about $130,000 for a rainy day. If Natalya had the money to buy these, I think she'd choose the Ostrich Egg. 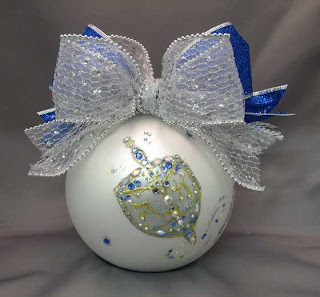 An ornament as expensive as the Hallmark one is just asking to be stolen. Although I know she'd take great care of it. Am I missing any other companies with luxurious Christmas goodies for me to drool over?